Every dart player winds up with a nickname sooner or later, and why not roll with it by branding your darts nickname with a cool logo and wardrobe? 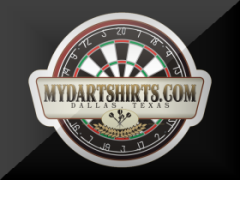 This week two more shooters made the step at mydartshirts.com. Mason commented on this blog post, "I'm training to be a chef, but I play darts. My thoughts are either a couple of crossed chef knives with darts etched in the blades. Or, maybe the same design (with the etching)but the knives in the dartboard. Well, I have been given a nickname from my team this year, Cornholio.". While approaching the design concept I discovered that knives left very little room for etching darts into the blades, so I opted for a cleaver chopping it's way into the dartboard. Mr. Happy - a local Dallas/Fort Worth area shooter - told me his nickname comes from - well let's just say his "focus and determination" at the oche. The design concept he relayed to me was something similar to our Shoot Well Design with a dart plowing through it's head like a bullet. Both design concepts are great references to each players nickname, and I hope these designs are enjoyed by both shooters as well as their team mates and fellow dart players. What are your wearing to play darts?